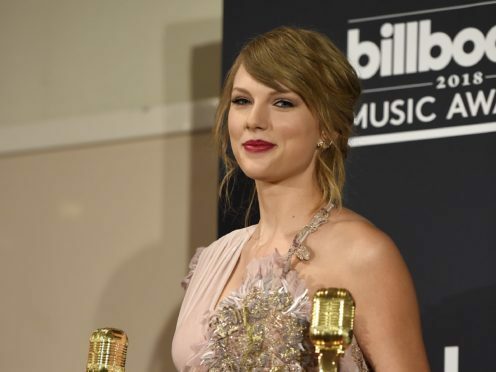 The Reputation star was a surprise special guest at the 2018 Billboard Music Awards in Las Vegas and walked away a winner on her comeback, scooping two of the biggest prizes of the night. She won both Top Female Artist and Top Selling Album. Swift, who took a break from her globe-trotting Reputation Tour to be at the Billboards, turned heads on the red carpet in a Versace dress teamed with Casadei shoes. The Love Story singer also wore plenty of jewellery, including Hueb earrings and rings from Sara Weinstock Jewelry and Maxior. Inside the MGM Grand Garden Arena, Swift took her front row seat next to Shawn Mendes and Camila Cabello. At past award ceremonies, Swift has been mocked for what some have called her “awkward” dance moves. But that didn’t stop her grooving at the Billboards. Swift appeared to be enjoying herself as she danced along to the music – especially when she mouthed the words to her own hit, Look What You Made Me Do. Swift is no stranger to winning awards and it was no different in Las Vegas. Following her award for Female Artist Of The Year, she made a graceful acceptance speech, thanking the women who had come before her. She said: “I want to thank all the artists, the female artists who paved the way for us to do what we do, the way we get to do it. As well as her awards, Swift also made new friends, posing for a picture backstage with Korean boyband BTS. And it wasn’t just the fans who enjoyed Swift’s return – the star herself thanked fans for making the Billboards fun.